The launch event at the Flint’s Performing Art Centre at Apple’s hometown, Cupertino, the tech tycoon managed to sway of the world with its wondrous devices. With iPhone 6, iPhone Plus, iPay, the list seemed endless and the one device that touched to our core was – Apple Watch! After a detailed introduction to Apple Watch, you will change the way you look at Smartwatches forever. It is chic, it is classy, it is comprehensive, and it is, all in all, a sensational gizmo that you will love to grab for your wrist. The Apple Watch is designed by Jony Ive and was demonstrated on 9 September, 2014 by Kevin Lynch. The same day Apple lovers were glittering in the glory of iPhone 6, Apple Watch managed to be the showstopper with its glamorous customizable designs and facile yet ineffable features. A customizable timepiece with a gazillion options to design your own watch face and personalize it to your choice with different colors and functionalities. To change the watch face designs, just use Force Touch and swipe a finger. Choose a watch face of your choice and tap it. The strap and style of the watch is easily changeable. The Apple Watch is available in custom alloys, stainless steel, aluminum and 18-karat gold with matching straps of leather, metal or plastic. Photos App provides all your favorite pictures from your iPhone or Mac to your Apple Watch. Maps not only help in finding out the locations, in fact dictate correct directions to reach your destination. The Apple Watch is endowed with a laminated crystal of sapphire display, which is considered the hardest transparent material after diamond. Moreover, Apple Watch has Flexible Retina Display for clear and pellucid show off of apps. Along with photo sensors, Apple Watch instills itself with infrared and LED to detect the pulse rate of the user. The Apple Watch is adorned with another exceptional feature, i.e. the display of the Smartwatch senses the force. To get the screen to clock, one can easily tap on clock button for personalized display of a regular wrist watch. To go to your favorite apps just swipe the screen and you will reach the Glances feature of the Apple Watch. By pressing the side button one will reach the Friends, the people with whom you stay in touch the most. You can send message, voice call or eve your location with another remarkable feature of Digital Touch. Digital Touch also allow the user to send self-made sketches with a single tap. You can send a tap on your friend’s wrist with Digital Touch, no matter how far you both are, only if he or she also have Apple Watch. If you press two fingers at the screen, your heartbeat will be captured and can be sent to any person of your choice. Yet another astonishing feature of Taptic Engine alerts you of any incoming communication without ever alerting anyone near you. Siri is now available to its fans at Apple Watch as well. Press and keep holding the Digital Crown and you will be directed to Siri. Search your next party location, find your calendar marked dates or just dictate a message. Siri is there for everything. For all the Fitness Lovers out there, Apple Watch is literally a boon for you all. With all day fitness tracker counting your every stand-up and custom sensors for constant measurement of your heart rate or an accelerometer for your every body movement, Apple Watch is here to make you fit as a fiddle. Move- shows how active you are in your life. Exercise- shows all the brisk activities of day-to-day life. The Workout app covers the calories, distance, time and speed of your workout activities. Apple Watch is compatible with iPhone 5,5S, 5C, 6 and 6 Plus. Apple Plus will hit the market across the globe in the early months of next year at the price of $349. 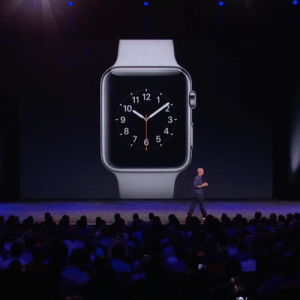 The phenomenal Apple Watch is a device to clasp as soon as it enters the tech world. The lauch of Apple watch really has hrabbed the attention of million users all around the world. It is very comfortable to wear and it is like as that you carry information that moves with you.